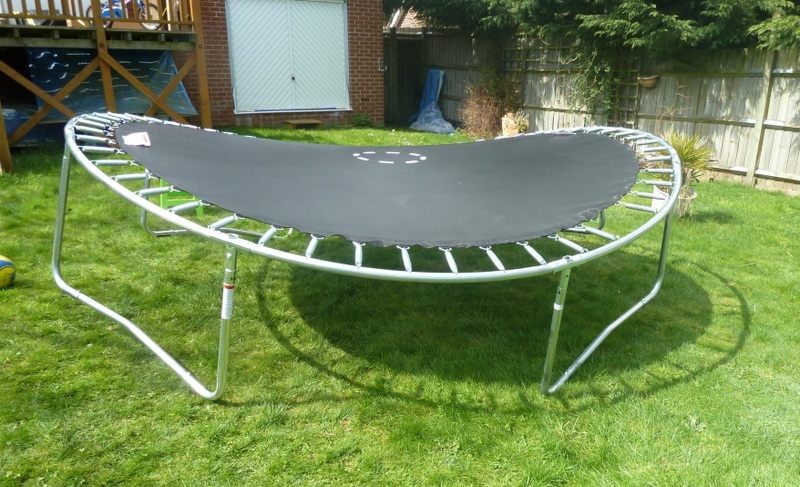 We bought a trampoline from a well know national retailer last week, the assembly instructions were actually very good, but as it was going together we noticed that the joints were loose fitting and the 6mm screws supplied had corresponding 8mm holes. We went in for a cup of tea only to come back to this. 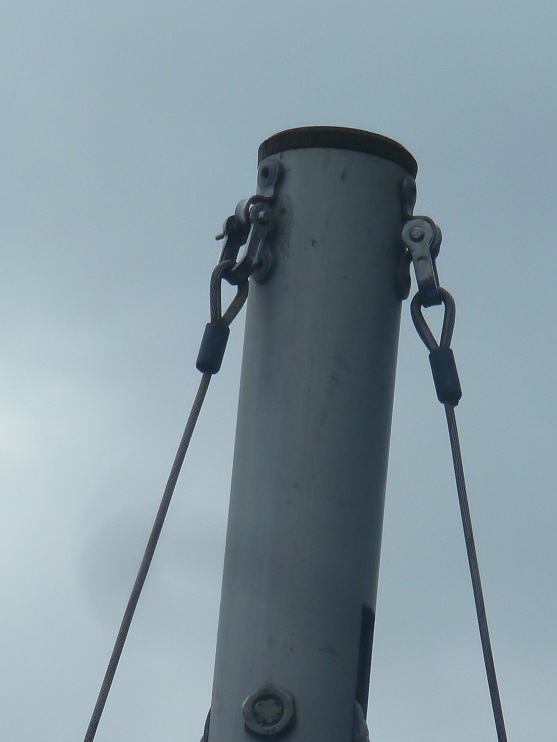 A bit of research showed that the 14 foot model from the same manufacturer had been subject to a product recall in the United States. 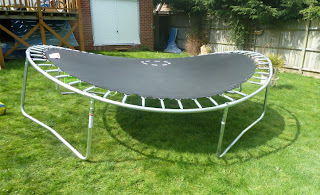 The retailer took it back without any hesitation, but we'd wasted 2 hours putting it together and another hour taking it apart, plus we had a very disappointed child. All week the days have been fine and sunny, thoughts of getting out sailing at the weekend after a long winter. And what happens Friday arrives, the wind goes round to the north and we're in for a cold spell. Like they say better a bad day on the water than a good day in the office. 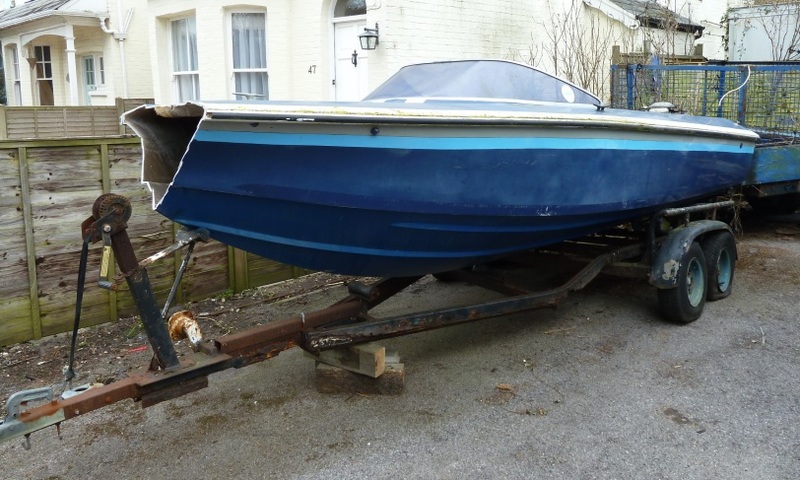 A friend had asked me along to look at powerboats he is considering to purchase, one which wasn't on the list but very interesting was the Hysucat, sadly not looking its best as one of the tubes has been punctured in transit. 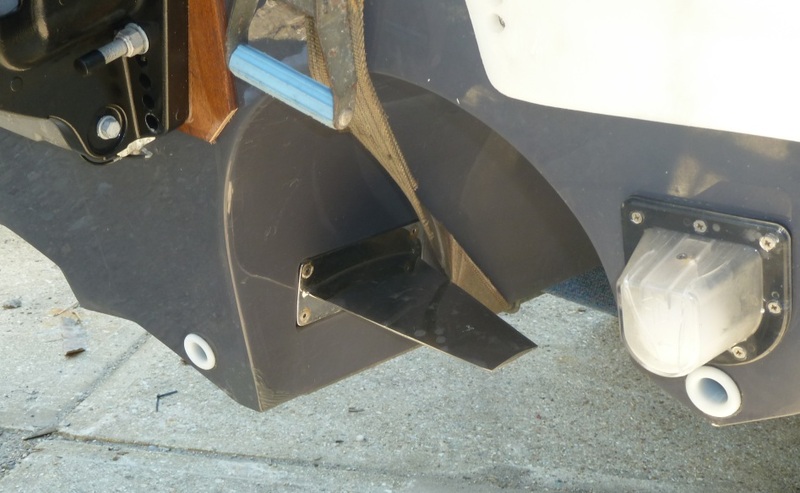 What makes the rib interesting is the twin hull configuration with a hydrofoil set between the hulls. 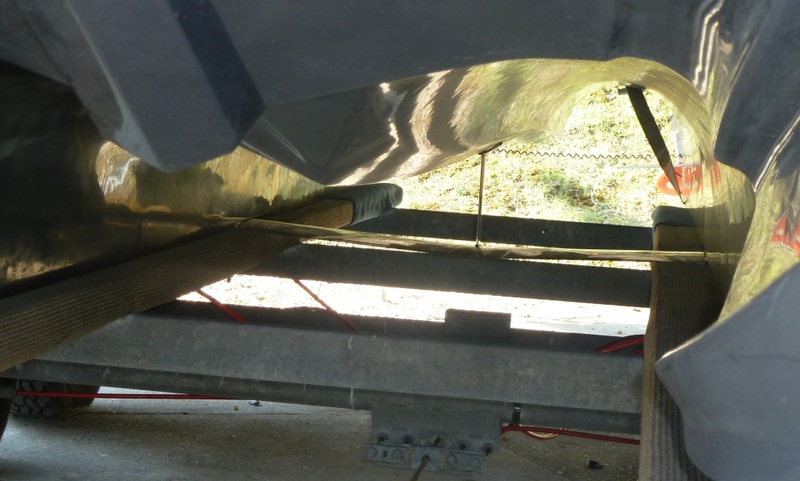 Sadly the picture isn't that good, but looking from the bow between the hulls the forward hydrofoil can be seen. 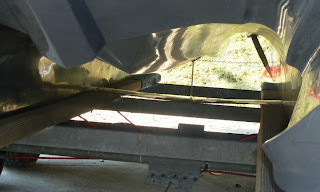 At the stern two stub hydrofoils are fitted between the hulls. 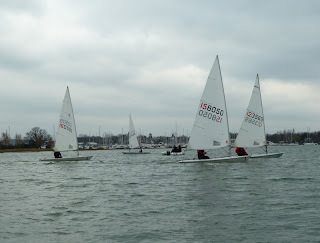 The designers claim use of the foils gives speed with lower power requirements. 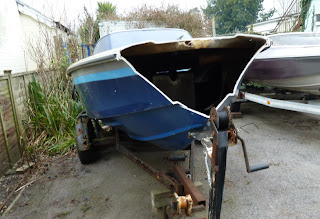 Additionally because the boat is travelling on the foils it will slice through waves and chop, travelling very evenly without the pounding of a normal deep vee type rib. 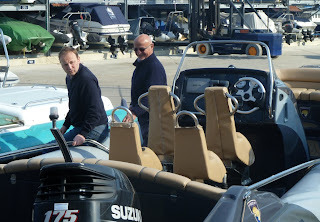 Friend Mark seen here inspecting the luxury interior with Power Boat journalist and naval architect Paul Lemmer who kindly showed us around. 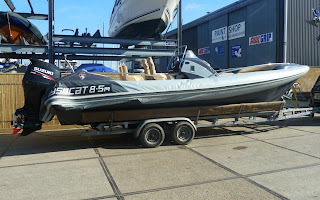 Check out the twin 175HP outboards. The 5 meter aluminium tube I bought to make the SCOW mast arrived last week, so with midday high water in prospect we went down to Keyhaven at the weekend hoping that the SCOWs would be out sailing and that I would be able to see how the masts are rigged, there being wide differences between the various SCOW types. 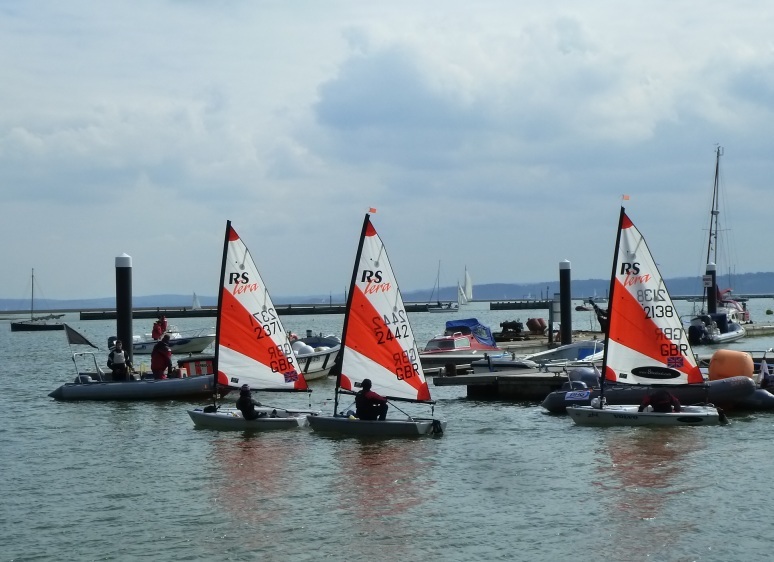 Inevitably a few non SCOW types got in the way, but between the boats which were sailing and a good look around the dinghy park, I managed to get a few good pictures of both standing and running rigging. 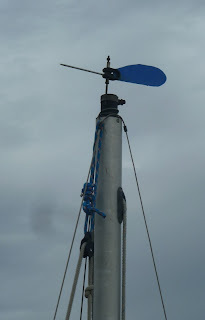 Traditional wooden mast top (is it called a dolly?) 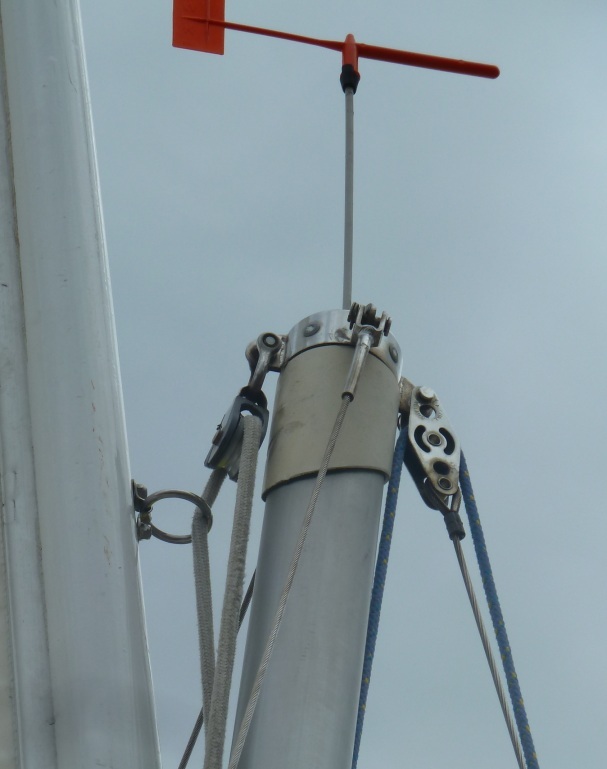 with traditional rigging loops, simple to make and effective, I quite like the internal halyards as well. 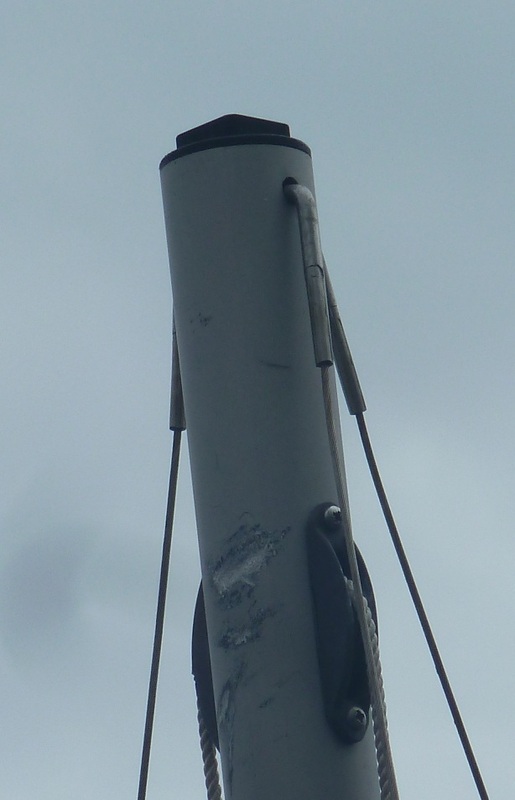 A Lymington SCOW mast head, I know that because I'd previosuly wandered around the dinghy park in Lymington and all the SCOWs look like this. I suppose I could have just bought a mast from John Claridge Boats including rigging and blocks for £250, but the ally tube cost £25 so I think I might be quids in even with some fancy spectra rigging. 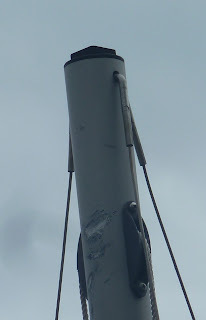 A modern mast with t ball terminals, presumably good for reduced wind-age and weight, bit too high tech. There's quite a bit of damage up there which is a worry. And those internal halyards, available from Allen Brothers - did I mention that I quite like them? No doubt a few folk will pull a face at this, but it's a lug rigged dinghy, all parts available on a quick trip to the local chandlers, very appealing. 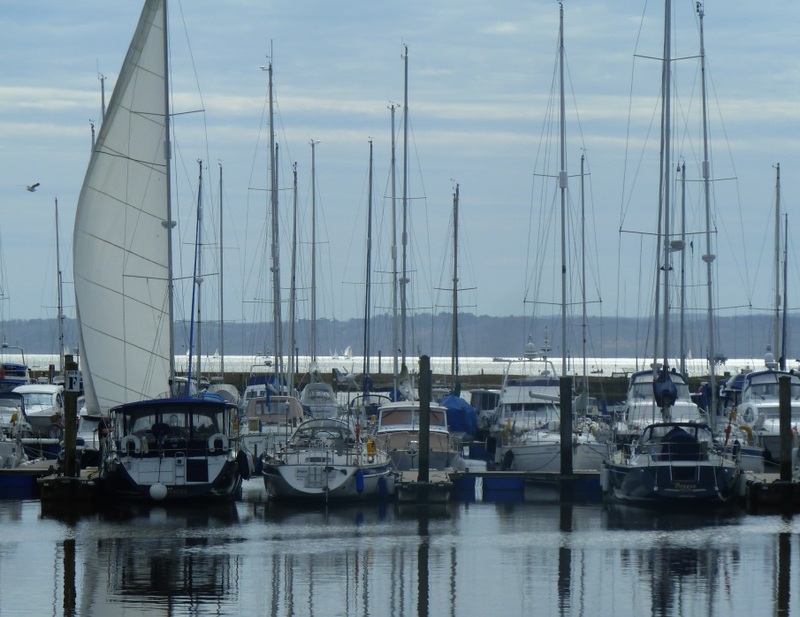 I've always liked Godolphin, the wooden motor boat on the right, she sits on the moorings opposite the park in Lymington with that big winch, presumably for hauling some kind of fishing gear. There's something very timeless about the raised foredeck, the safe and cosy shelter over the steering position, yet open and spacious connecting the crew with the surroundings. Very typical of pre war boats of this type and size. That the overall design works well is perhaps reflected in the new GRP boat lying just astern. 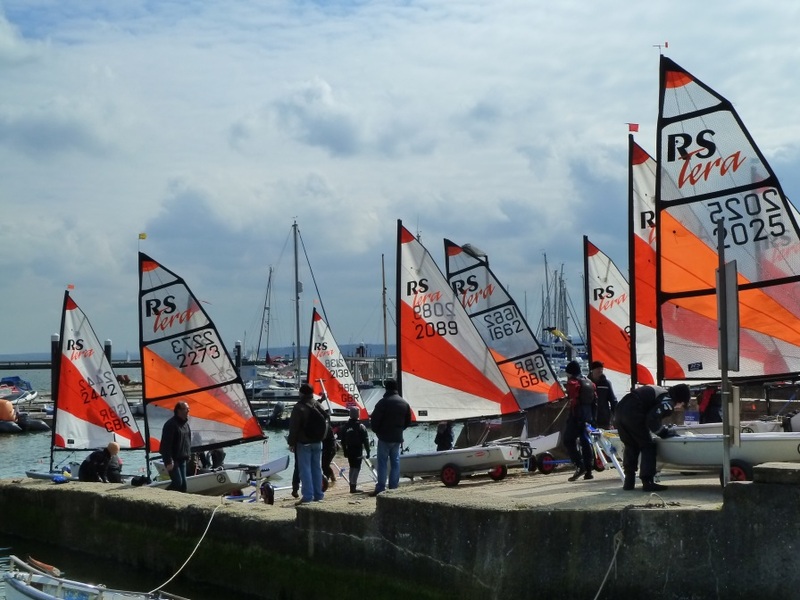 Down on Lymington slipway watching the visiting RS Tera fleet, I got to talking to the chap stood next to me. 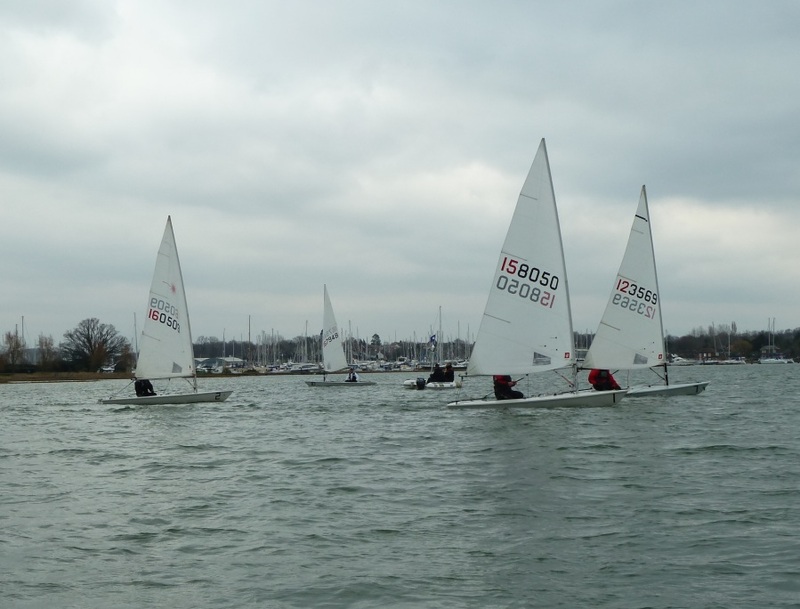 "Terrible weather, yesterday was the first time I've launched the dinghy all year, cold but a nice sail." 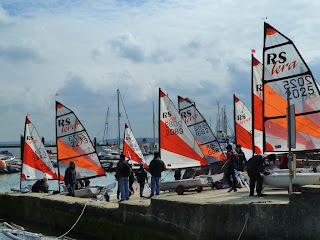 "What kind of dinghy do you sail?" "Wow, me too, not many of us around." "We're in the market for an Oppi or similar, I like these." nodding over at Joseph who was scooting around the car park. "Mind you they've come a long way from the 'soap box boat'. I've been looking at an American boat called an El Toro, like an Opti but for home build"
"What about a SCOW, they're good for kids?" "Hmm, got one of those or rather just finishing restoring one for my wife,"
"You don't live in Bursledon do you?" "Funny you should mention that I'm the Bursledon Blogger." 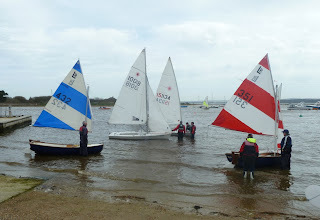 "I'm the Keyhaven Potterer, nice to meet you"
We've exchanged loads of emails and comments but had never met, Brian is a regular on many sailing blog, major contributor to the wooden boat forum and font of knowledge on boats. 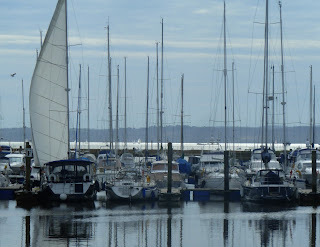 We've discussed meeting up for a sail at Keyhaven with our respective Cormorants, but both concluded that between the tides and the Solent weather, planning ahead is difficult. 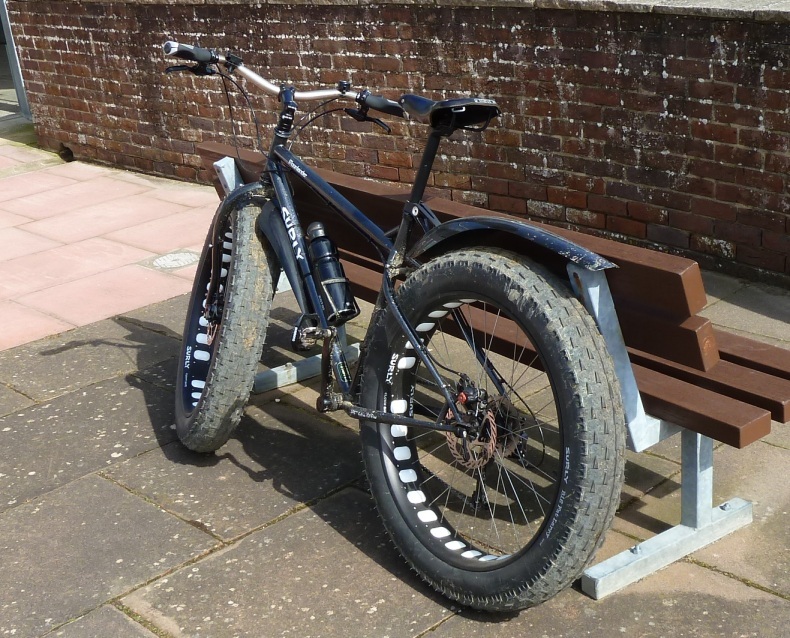 After a good chat, introductions to Erica and Joesph, Brian made off towards Keyhaven on the appropriately named Fat Bike - love those tyres! Well in the middle of the afternoon! 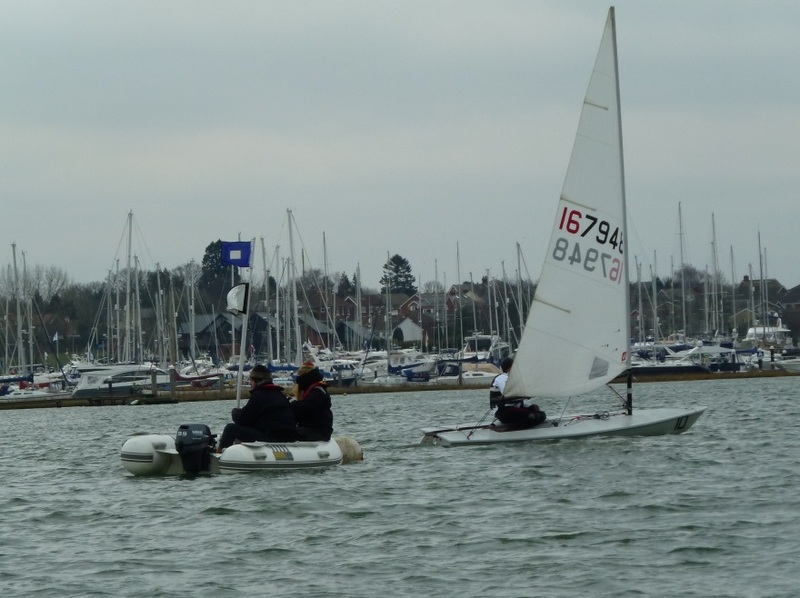 There I was I was rowing down the river recently keeping an eye on the Bursledon Laser fleet who were out in the cold and blustery conditions. I made a deliberate effort to keep out of the way, staying well past the committee boat and close up to the moorings, when out of nowhere I was tee boned by a Laser. 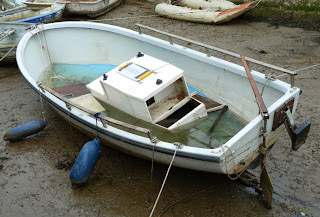 Fortunately no damage done, but by the way next time you see me in the Jolly Sailor mine's a bottle of Blanford Fly. Now I confess to not knowing too much about motor boats, but this modification was intriguing, maybe a "pram" bow is the latest go faster conversion in the speedboat world? Other ideas were reducing mooring fees which are charged per foot or maybe it was a necessary mod simply to fit the trailer? 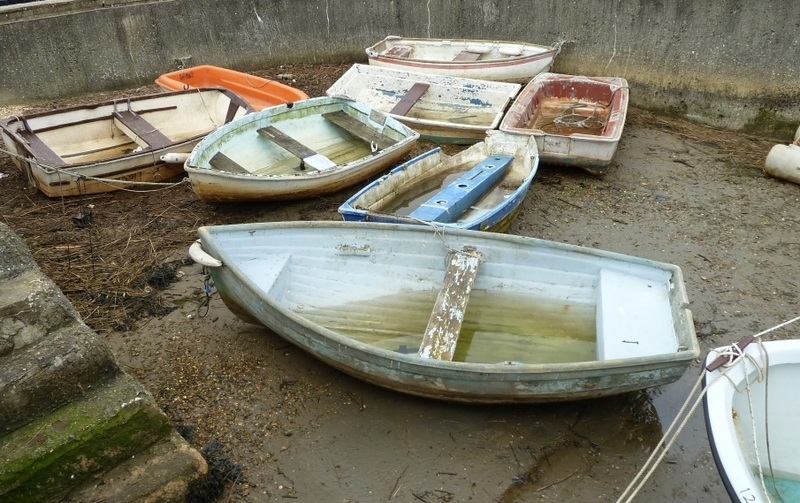 This motley collection of dinghies and tenders were pulled up on the hard the other day and left me wondering why so many British yachtsmen treat their dinghies so badly? Perhaps it;s something which is confined to the UK, certainly from our time in the Caribbean the average American yacht would be sporting a smart Carib or AB rib which you can't imagine being left and neglected to get in this sort of condition. I know the argument that tenders left at the dinghy dock have a hard life, but come on, these relics haven't seen a hint of care and attention let alone a lick of paint since who knows when. Take the bottom example, which admittedly is a bit more than a tender, the prop seems to be missing and if there is an engine inside that box I dread to think what the exterior will be like even if the water hasn't got inside! I guess someone will say as long as it floats what's the problem, but where's the pride in ownership or even simple economics, these boats aren't cheap to buy or replace.